Shaenon: More news on my old comic, Narbonic, which takes place in the Skin Horse universe and is about the kind of people Project Skin Horse has to clean up after. 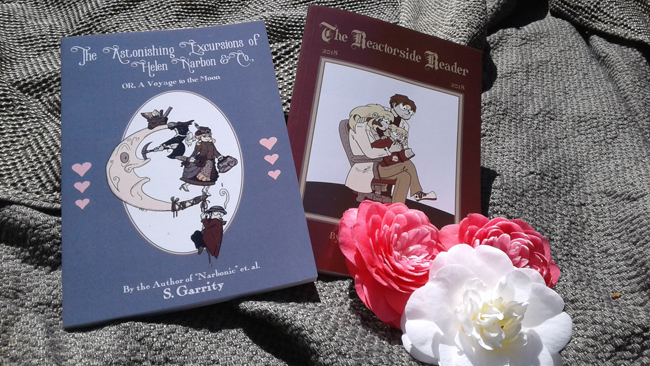 I have two beautiful new books of Narbonic comics! The Astonishing Excursions of Helen Narbon &Co. is a Victorian-themed side story people have been asking me to put out in print for years. The Reactorside Reader collects all the Narbonic short stories I’ve done since the end of the strip, including the Narbonic comics in the Couscous Collective anthologies and two prose stories. Both of these books were funded as stretch goals during the Kickstarter for the new Narbonic reprint. Thank you so much to everyone who made this happen! If you weren’t part of the Kickstarter and you want these awesome books, they’re available at the Couscous store. Channing: As a superfan of the scary sort of Narbonic, I believe a yes—pardon, a hella yes—is in order. I, for one, am positively giddy with anticipation! I wish that I wasn’t so poor so that I could buy these and the reprint! Good! I’ll order copies in a day or so—I try not to order things when I’m here in bed working with my laptop. Thank you for announcing this wonderful thing so close to my birthday! It is unbecoming to order birthday presents for oneself, but this is where giving cash is useful: I hereby redesignate one present to this. Wait, is Jeff a scary sort of Narbonic fan or is the scary sort of Narbonic what he’s a fan of? What would the scary sort of Narbonic be? I kind of figured that any sort of Narbonic would be a little scary. Dr. Narbon is a lot scary. Wouldn’t it be more accurate to say that Skin Horse exists in the Narbonicverse since one clearly predates the other? I have now ordered two copies of the Reactorside Reader – one for myself, and one for my sister. I don’t know how I missed the boat on this, but if they’re ever available as ebooks, I’ll buy them. Keep checking the store. The Narbonic Perfect Collection is already available in e-book form, so I’d be surprised if these two additional books don’t show up before long as well. I hate to mention it, but mail disappears off my porch, so I’ll have to have the packages sent with some sort of registered status.